Lesotho annually celebrates the birthday of Letsie III, the reigning king, on July 17. This public holiday is known as King’s Birthday. King Letsie III was born on July 17, 1963. He succeeded his father, King Moshoeshoe II in 1990 and reigned till 1995. In 1995 his father was restored again and reigned till death in a car accident in 1996. King Letsie III resumed his power again on February 7, 1996 and now he is an acting King of Lesotho. 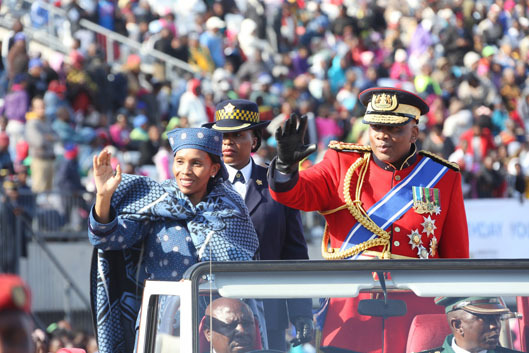 King’s Birthday is celebrated in Lesotho since 2003. Every year festive events are organized in different cities of Lesotho, so that all citizens can enjoy the holiday and appreciate the importance of King’s Birthday. Traditional events of celebration of King’s Birthday include choral music and famo music, traditional dances ndlamo and mokhibo. The Christian Council reads a prayer and the Royal Salute organizes a firework. Military parade is also held on the streets of the hosting city. The crowd gathers on the streets of the city to greet the King.